Ingredients: Ascorbic acid, citric acid, sorbitol, sodium dicarbonate. Suggested Use: One tablet fully neutralizes 1 ppm chlorine and chloramines in 100 gallons of water. Preferably one tablet per bath. Not for human consumption. Store at room temperature; Avoid excessive heat and moisture. 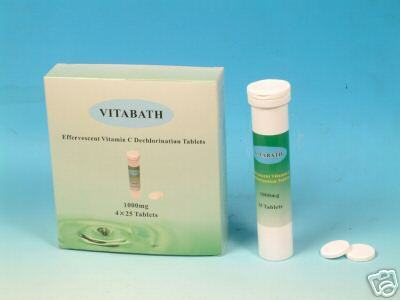 Effervescent Vitamin C Dechlorination Tablets(100 tablets): Retail - $19.95!